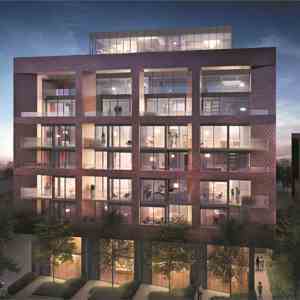 The Roncy, the brick facade yet elegant condominium located in prime urban community, Toronto’s Roncesvalles Village. 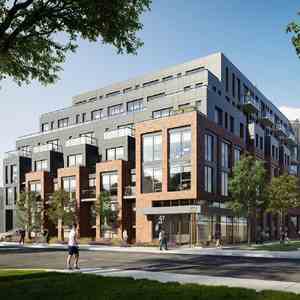 The Roncy features an eight storey Condo with ground level commercial spaces which add new retail to the already vibrant neighbourhood. 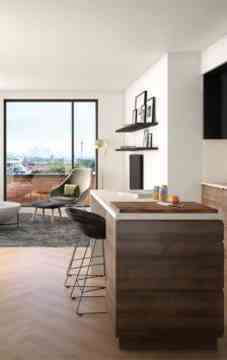 - A selection of spacious suites ranging from one bedroom units to three bedroom suites with dens and lofts. - Wide plank laminate hardwood floors. - Floor to ceiling windows. - Contemporary flat panel cabinetry with over-height cabinets enhanced with brushed chrome pulls in kitchen. - Large waterfall islands and granite or quartz countertops in kitchen. 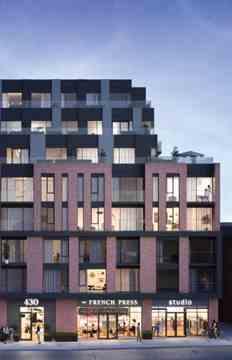 The Roncy is a condo and townhouse development by Worsley Urban and located at 436 Roncesvalles Avenue, Toronto. There are choices of public transportation, including the TTC subway at Dundas West Station, the Go Train and the UP Express. Worsley Urban is a boutique property developer based out of Toronto. Founded by developers Dino Longo and Howard Goldstein, Worsley Urban is committed to delivering quality boutique residential developments within urban communities. Worsley prides itself on pushing the design boundaries and combines traditional and contemporary architecture that complement the surrounding neighbourhoods. With an emphasis on architectural style, workmanship and sophisticated design, Worsley’s developments are sustainable dwellings that focus on creating everlasting value for their home buyers.